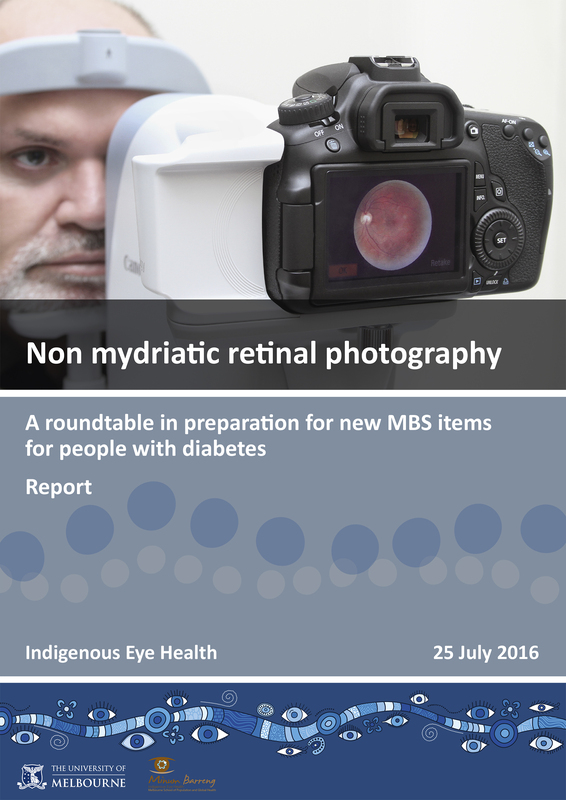 On 25 July 2016, Indigenous Eye Health at the University of Melbourne hosted ‘Non-mydriatic retinal photography - a roundtable in preparation for new MBS items for people with diabetes’. This meeting brought together representatives from peak national bodies across Australia, covering Indigenous health, eye care and diabetes, to discuss approaches and actions necessary to support the successful introduction of new Medicare Benefits Schedule (MBS) items for non- mydriatic retinal photography (NMRP) for people with diabetes. Participants were provided with updates including currently available information and resources, discussed the barriers and solutions to increase diabetic retinopathy (DR) screening rates in Aboriginal Medical Services (AMS) and mainstream practices, and identified some of the next steps for implementation. Thirty-one people attended the meeting representing fourteen organisations.